First, I know I’m not a model, this was just for fun. But More magazine and Wilhelmina apparently have a modeling contest every year for women over 40. There are lots of prizes and gift bags so I thought, what the hell? Unfortunately, a few things went wrong. 2. You’re supposed to bring a picture. 3. It cost MONEY to enter. It was $25, but I’d already gotten up early and showered and trekked over to the wrong address, so I paid it. They took polaroids of the people without pictures, but the picture they took of me totally sucked. I can re-enter by mail, which I am tempted to do, but it costs another $25, and it’s not like I could win. It all worked out in the end because they gave everyone a great gift bag full of Garnier Fructis products I actually would want and will use, and other do-dads. I’m sure it’s all worth more than the $25, so the fee was a wash. 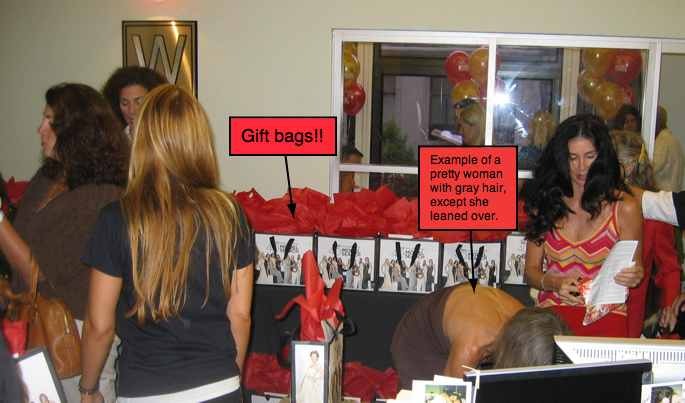 Here are some of my fellow contestants, and the all important GIFT BAGS. i think i’m going to enter the contest. the one thing that bothers me though is that it seems in order to win, you must hold some high-powered position at a fortune 500 company or have started a non-profit organization that works to secure equal rights for people with two different-colored eyes, or some such. seems like housewives, waitresses, and lowly proofreaders need not apply. that really bugs me. what do you think?